As IFSCwc, kicks off today, we present you the finest Male atheletes from India who will participating in the Climbing Worldcup in Navi Mumbai 2016. Come to CIDCO Exhibition Centre and watch them scale new heights. 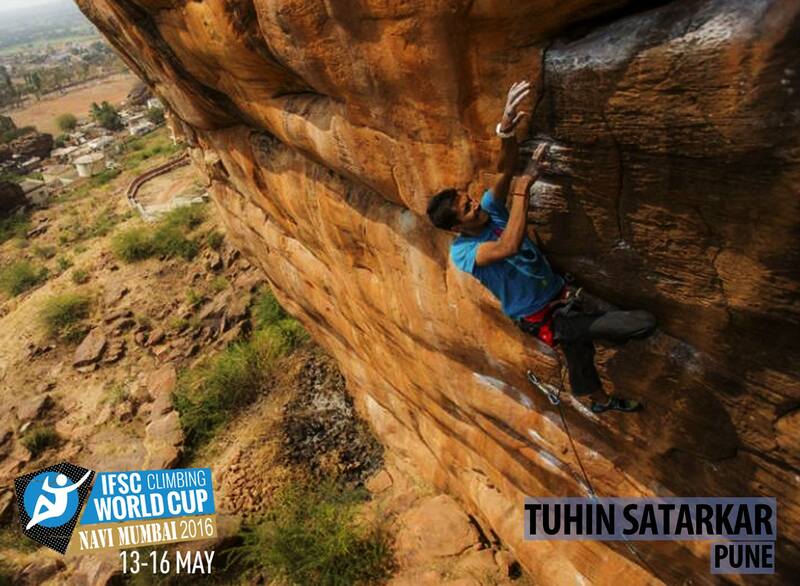 Tuhin Satarkar: Tuhin started climbing at a very early age of 7. Thanks to his parents who are climbers too. After getting addicted to this sport, he never looked back. Since then he has participated in several National and International climbing competitions and made everyone proud by winning many of them. In 2014, he became the first Indian to scale Ganesh (8B+) in India. For non climbers who are wondering what does that mean then to put in simple words – It is India’s toughest Climbing route. At age of 21 he has established himself in this sport and is also Red Bull Athlete. 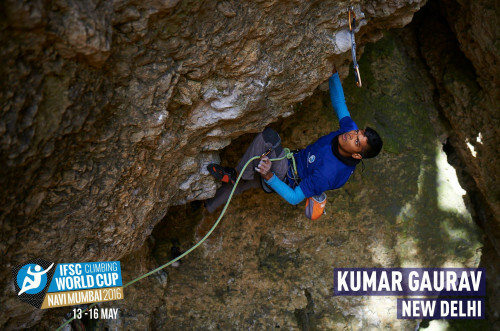 Gaurav Kumar: He is just 20 years of age and a strong competitor for IFSC 2016 world cup. He is been in the climbing circuit for a very long time now. In October 2014 he became the second Indian to scale Ganesha in Badami. His pursuit of scaling ganesh can be easily turned into an inspirational movie. Gaurav kept trying to scale ganesh for 11 straight days and failed every day. On 12th day again he failed and also injured himself. Day 13 was suppose to be his rest day but he still went for the climb and when it was least expected he scaled to the top. Someone has rightly said when there is no fear of failure you reach the top. Respect for the Young Man. Adarsh Singh: He started climbing at the age of 12. He has participated in many climbing competition in India(junior level category). He has won several competition under junior boys category. 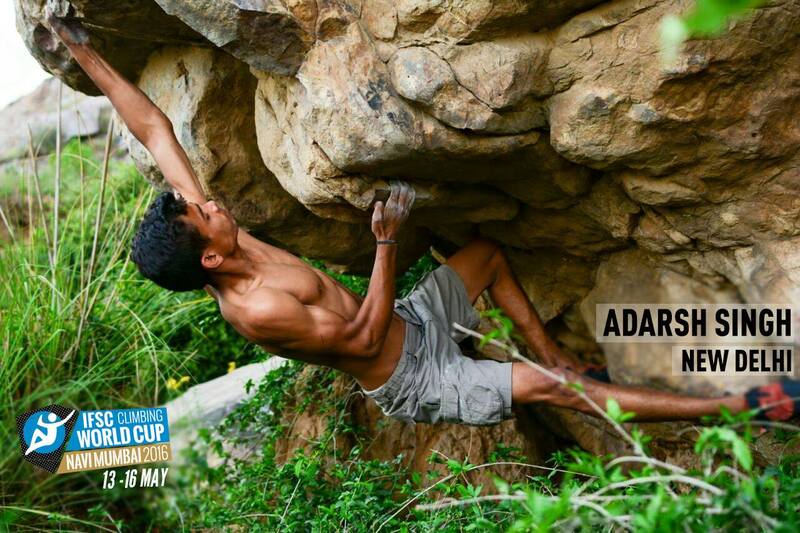 Adarsh is so good in all the 3 climbing events that he has won competition in Speed, Lead and Bouldering categories too. 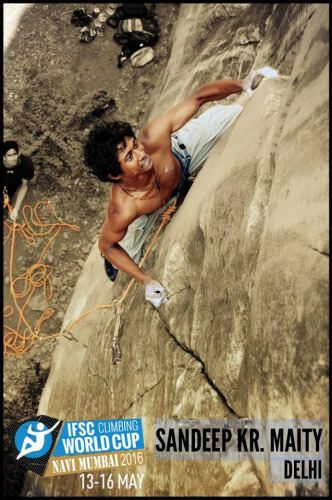 When he ascended 7B and 7C in Hampi he became the youngest climber in India to achieve it. Come to Navi Mumbai and see Adarsh live in action. Ajij Shaikh: A large percentage of world population suffer from fear of heights and almost all of them fear heights for rest of their lives. But Ajij Shaikh is not among them. He not only conquered his fear of heights but also took up climbing professionally. He is come a long way having won national title for 4 times consecutively. This young man is truly a source of Inspiration for all of us. 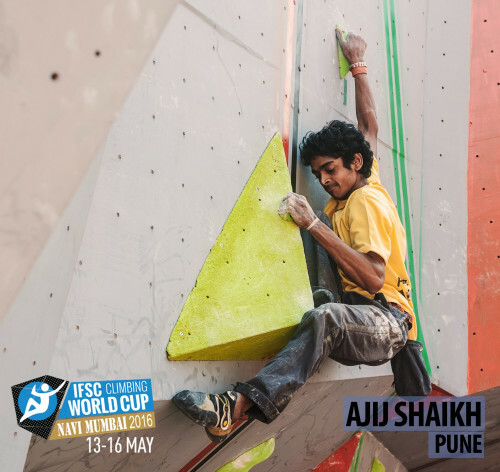 Ajij is based in Pune, he is also first Indian to ascend V11 / 8 or popularly known as “the Diamond”. Earlier Ajij had represented India in World and Asian Championship and is among top competitors in this World Championship. 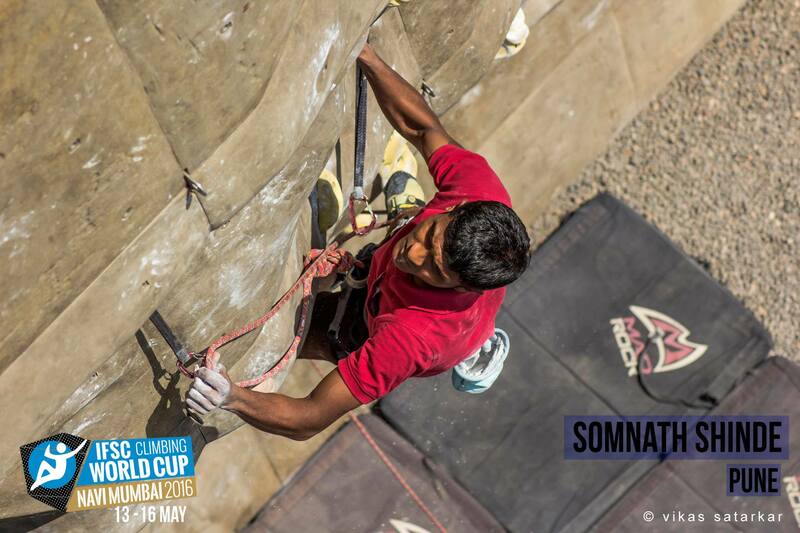 Somnath Shinde: Somnath who is popularly known as Tatya has been climbing since last 10 years. He has not only participated in various national and international Competitions but also won many of them. He bagged Gold in 2014 National Championship and Silver in 2015 National Championship. Sandeep maity: Sandeep is from Delhi and has been a passionate climber right from the start. In April 2016, he bagged gold medal in national championship held in Singapore. All eyes are on him whether he can repeat his last month achievement. He likes solving bouldering problems and you will often find him taking leads in Hampi, Badami, Leh and other climbing places in India. His smiley face, curly hair and athletic built has got him many female fan followers. Come to Navi Mumbai to watch him ascent to the top with powerful and swift moves. 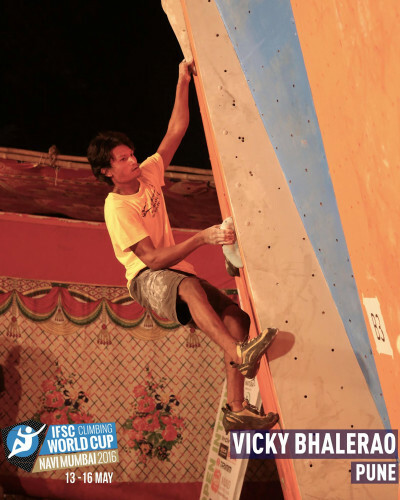 Vicky Bhalerao: Vicky came in the limelight by winning Girivihar Open Climbing Competition in 2009 in Juniors category. Later in 2012 underseniors category, he came 3rd in lead, 2nd in Bouldering and 1st in Speed. He has also completed the famous 8a – Middle way . 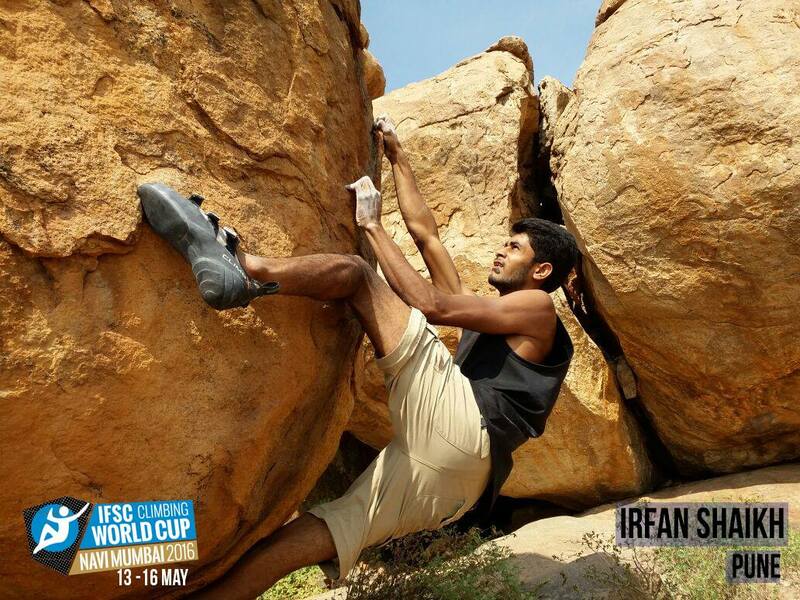 Every year he visits Hampi, India’s favorite Bouldering destination. Bhalerao is from Pune where he is a full time trainer at 50 feet high International Climbing wall off JM road. Vicky, Ajij, Tuhin and Mayuri often group up together and ascent new climbing routes and challenges. Irfan Shaikh is from Pune, India and was an hockey player before he discovered his love for Climibing. A tough boulderer he has been on the podium several times in various competitions like Zonals, Nationals, Open Internationals. He aspires to ascent Ganesha 8b+ in Badami and go to Ladakh Himalaya to take a step into Big Wall climbing.